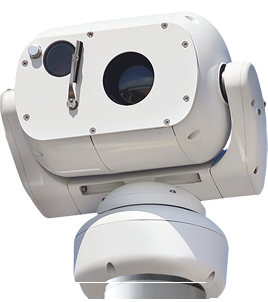 The Aeron is a compact, rugged, continuous rotation PTZ camera that has been specifically designed for harsh and challenging environments. Utilizing the latest SD and HD camera modules, the Aeron can provide analogue, HD-SDI as well as IP video outputs. The Aeron is available with Infra-Red Illumination, White Light Illumination as well as IR/White Light Hybrid Illumination. Utilising the latest SD and HD camera modules, the Aeron can provide analogue, HD-IP as well as HD-SDI video outputs. For low and zero light conditions IR or White LED illuminators can be built into the unit giving enhanced images to provide a greater range of detection. The Aeron is incredibly versatile with its flexible mounting options to achieve a perfect field of view. Being able to be mounted upright, inverted can be applied to almost any given situation and environment. The unit has a full 360° continuous rotation with a rotation speed of 180° per second. Optical encoders for both the pan and tilt axis provide highly accurate positioning and repeatability, allied with self-correction systems that will counteract any external interference with the moving head. The fully compliant IP67 (with IP68 option) rating for dust and water means the rugged and compact design of the Aeron ensures the unit is designed to last and withstand the harshest of environments. The Aeron is constructed of a die-cast anodised aluminium casting with stainless fittings and toughened, scratch resistant optically correct glass. The glass can be kept clean and clear at all times with the use of the integrated compact silicone wiper blade with the option for a washing system. The working ambient temperature ranges from -20°c to +60°c and with the option of a heating system, the unit maintains reliable operation down to -40°c.